This year I prayed for our pastors, lay leaders and congregations, one Mission District at a time. As I consulted the map for your locations and contexts, I was reminded of places and people I have visited and those I look forward to seeing in the coming year. This year I have been asked to preach on Easter Sunday using the Gospel of John and decided to share with you my sermon in its current state as a word of encouragement to each of you during the Easter Triduum. 1. Alienated — cut loose, no longer deemed worthy of love, care, or support, fearing further pain and rejection. 2. Forsaken — abandoned and alone in the time of greatest need. 3. Uninspired — no role models or hero figures to which one can aspire. 4. Powerless — unable to attain life goals. 5. Oppressed — feeling crushed by circumstances overwhelmed. 6. Limited — deficient, not having what it takes to make it in this world. 7. Doomed — trapped in an irreversible decline. 8. Captive — trapped by circumstances or relationships. 9. Helpless — exposed and vulnerable, unsafe and at risk in the world. This crisis of hope affects our health, our emotional stability, our relationships and our spiritual life. It influences life in our homes, our work, our friendships, our neighborhoods, and even in the church. What makes our lack of hope a crisis is that many of those resources in which we have placed our hope in the past have failed us. We placed our hope in our finances and investments and are forced to face the collapse of banks and market volatility. We placed our hope in retirement accounts and social security and now realize we will have to work longer and be less secure. We placed our hope in the stability of our nation and now fear the growing national debt and the possibility of insolvency. We placed our hope in our unity but now are experiencing division and the polarization of our entire culture. We placed our hope in our strength and security but are now forced to live with the uncertainty of school shootings, violence, terrorism, and global annihilation. We placed our hope in the strength of our culture, but now live with the reality of moral collapse, family fragmentation and abuse. We placed our hope in our health but deal with the nearly constant news of those we love facing cancer, birth defects or infertility. We placed our hope in our own ability and strength and find ourselves overwhelmed and fearful. The hopelessness is apparent as suicide rates in a variety of population segments continue to grow each year. Is it any wonder you have experienced some sense of hopelessness? Jesus — who had taught them with strength, conviction and authority — cried out in pain and agony. She watched as the Messiah’s bloodied body was impaled on a cross, surrounded by criminals. For three hours she watched helplessly as this One — who loved her as she had never been loved before — bled until, with no more strength, He breathed His last. She saw the soldier pierce His side with a spear, running it through His lungs and into His heart to ensure He was dead. Perhaps she was there as the few brave souls removed His body from the cross and laid it in a tomb. The only act of love she could offer was to assist in preparing spices to anoint His body for completing His burial. She was overwhelmed by one layer of grief after another. Every moment, every scene, every act of violence against Jesus added to her loss, grief, pain and despair. Her hope was gone, completely! How is it possible that the circumstance could be any worse than it already was? Yet that is exactly what Mary experiences when she arrives at the tomb on that first Easter morning. She sees the stone rolled away and the body of Jesus gone. Mary’s conclusion: the tomb had been robbed and the body of Jesus stolen by a gardener. She is deprived of her last opportunity to offer her love by anointing His body with oils and spices. She might have asked herself, am I the only one who cares? Most of the disciples are hiding, afraid they too will end up like Jesus, crucified and buried. Only Peter and John go to check out Mary’s story. In John’s Gospel they get credit for believing, but notice they don’t stay very long — they simply returned home. It was only Mary who stayed, still immersed in her grief, preoccupied with her own pain, overwhelmed by the tragedy and loss, despairing and hopeless. I imagine that she was praying and crying out to God through her tears. I had a moment like that not long ago. In March 15, 2013, I awoke at 2 a.m. in severe pain. Not wanting to disturb my wife, I left the bedroom to pace and find a place where I could moan in agony alone. I had never experienced pain like this before. It welled up, sending shock waves through my entire body. No surface, hard or soft, would bring relief. Pacing, walking, leaning provided the greatest distraction. The pain became so intense the tears welled in my eyes. Through the tears I prayed and prayed, but my words seemed to only bounce off the walls, never reaching the Lord. The pain worsened until my body’s reaction was to vomit. The heaving momentarily relieved the pain as I slumped in exhaustion. The harder I prayed the more silent God seemed. That cycle was repeated two more times, and each time I prayed it was the last of the pain. Internally, I was battling with myself. Generally, I hate doctors and hospitals. I kept thinking I could do this on my own, if the Lord would only help me. “Lord, help me!” The harder I prayed the more distant God seemed. The next two rounds of pain caused the room to spin and my body to go limp. The pain became all-consuming, the only thing I could focus on. Even as it subsided, fear of the next wave was equally all-consuming. Trying to stand outside of my pain and pray was impossible. The harder I tried, the worse it got. The only thing I could do was admit my powerless state, my overwhelming need, and resolve to seek help beyond myself. We sense the all-consuming nature of Mary’s pain when we read that next verse of this Easter text. She turns around. She looks away from the tomb and right into the eyes of Jesus, and the only thing she can see is her own pain. This is a part of our Holy Week experience — the prayer of the forsaken. On Good Friday we hear Jesus cry out from the cross, “My God, My god, why hast thou forsaken me?” Some Church Fathers refer to this as Deus Absconditus, the God who is hidden. We feel abandoned, our hope evaporated, our dreams meaningless. Like the psalmist we cry out, “I call all day, my God, but you never answer” (Psa 22:2). St. John of the Cross called it “the dark night of the soul.” The witness of Scripture is not that we live avoiding it, but rather we should expect it and even embrace it, stay with it. Being alone with our pain, the purifying silence of God can transform us. It strips away our sense of control, our priorities, our self-reliance. We become much more tentative and unsure. Richard Foster writes, “Through all of this, paradoxically, God is purifying our faith by threatening to destroy it.” The superficial things we trusted in are stripped away and, through those moments that seem “God-forsaken,” within us God is growing humility, patience, perseverance and the longing to see and know only Him. Mary turns around and is looking right into the face of Jesus and she sees only the gardener. Her vision is still blurred by her tears. Nothing has yet changed her experience of overwhelming grief and pain. Jesus asks her why she is crying and who she is looking for? Jesus is alive. He is present. He is with her, beside her. Yet all she sees is a gardener. Does this tell you something about the all-consuming power of hopelessness, grief, pain and fear? Her anger is unabated. Thinking He is the gardener, Mary accuses Jesus of having carried away His own body. Mary demands to know where He placed it so she can go and reclaim it! Don’t laugh at her; we too can be blinded by His presence. In the “dark night of the soul” it is not that God has disappeared, rather His hiddenness is only to help us! Jesus only has to speak one word to Mary to move her from confronting a stranger to a moment of great intimacy that places her in the presence of her Lord and the Savior of her soul. Jesus calls her by name, “Mary.” In that moment her pain is overcome by His presence and she, too, speaks words of intimate endearment, “My Teacher, Rabbouni,” I wonder, did she use that term because of the past three years of her journey with Jesus or because of the startling revelation of the previous three minutes or the past three days of her grief and loss? Perhaps in those last three days and final three minutes something was stripped away — removed — and something more powerful transformed her: the reality of the Resurrection. An overwhelming absence is replaced by an even more overwhelming presence. Jesus had just taught her the most important truth of faith. The Resurrection transforms a hopeless end into an endless hope. Any doubts about His capacity to redeem and save us vanish with the reality of the Resurrection. The Resurrection shows that our faith does not depend on our own adequacy. It depends on the power of God. The disciples failed repeatedly, yet the Gospel goes forward by God’s power, not by our successes. Failure is not the end. Don’t we need to hear that? Failure is not the end. God is at work — even through our failings. Today we come not just to see or hear about the Resurrection but to experience it, like Mary experienced it. The power of the Resurrection was released in Mary’s life as soon as Jesus called her name. The assurance of the Resurrection as the Apostles experienced it through Jesus transformed them into fearless, adventurous, courageous, hope- filled leaders. Their witness is also a powerful proof of the Resurrection. The reality of the Resurrection is not something we wait on for some future experience but the reality that fills and sustains us now. Jesus said, “Because I live, you will live also” (John 14:19). “He is risen!” became the joyous chant of a new life — hope fulfilled. Through faith in Jesus the same power of God that raised Jesus now lives in you. This is why Paul tells us that we can do all things through Christ who strengthens us (Phil 4:13). Even when there appears to be no hope from a human point of view, I still live in hope because the power of God lives in me. Life does not limit me like it did before. Paul says in Romans 6, “Since we have been united with Him in His death, we will also be raised as He was.” That’s not just by and by when we die. We are raised to new life right now. He says, our old sinful selves were crucified with Christ so that sin might lose its power in our lives. We are no longer slaves to sin. For when we died with Christ we were set free from the power of sin. Now the power of God lives in us, rather than the power of sin. And since we died with Christ, we know we will also share His new life. 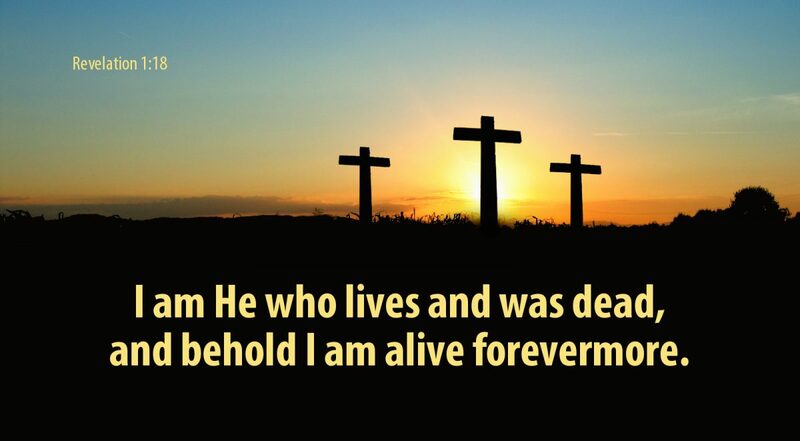 We are sure of this because Christ rose from the dead, and He will never die again. Paul concludes, “So you should consider yourselves dead to sin and able to live for the glory of God through Christ Jesus” (Rom 6:5-9, 11). Obediently, Mary went to proclaim the Resurrection of Jesus to His disciples and gave them all the instructions Jesus passed on to her. So it began. We have the record of how these disciples responded to this news, how it transformed their lives. We see in Acts the demonstration of their faith, their bold proclamation, the fearless risking of their lives, their obedience and allegiance to Jesus. We behold the strength of their love for one another and their willingness to include others in their community of faith, their willingness to reach out with Christ’s love. The disciples lived in such a way so as to demonstrate the power and the hope of the Resurrection. Easter is the epicenter of our faith, hope and love. We worship on the first day of the week because this was when Mary had the encounter with the resurrected Lord. Easter is the center of the church year, the center of our worship and it must also be the center of our individual lives as well. That is the hope available to us through faith in Jesus. Of all people in the world, Christians should be the most hope filled. Christian churches should be the beacons of hope for every community. Having hope is not the end but the beginning. We have not simply been called to get our dose of hope and leave. We have been called to something more. The world I described to you at the beginning of this sermon is in desperate need of hope that can only come through the eternal love of Jesus. Within the span of our worship today, people in this community will be diagnosed with or die from cancer; others will die from alcohol abuse, AIDS, or drug overdoses. Several will commit suicide and a few more will die in traffic accidents. Some will lose jobs or homes. Without hope, anger will turn to violence, and violence will turn into stolen property, abusive homes and broken relationships. The question is, how do we move this beacon of hope that is the church out there into the places of hopelessness, where the compassionate love of Jesus is so desperately needed? Do you know anyone here that might be going in their direction? While it is true that we gather together to proclaim the hope we have in Jesus, our resurrected Lord and Savior, we also gather together to be equipped to share that compassionate love of Jesus with family, friends, co-workers, and neighbors in the grip of hopeless circumstances. I don’t mean to spoil the mood on a perfectly wonderful celebration, but what would you say to a family member who has just been diagnosed with cancer or to a parent whose son or daughter has been given only months to live? Scripture tell us, “Always be prepared to give an answer to everyone who asks for the hope that you have” (1 Pet 3:15). Paul reminds us that we are Christ’s ambassadors, as though God were making His appeal through us (2 Cor 5:20). We gather together today not only to hear the proclamation of our reason for hope but to be the Easter presence of Jesus out there in our world. We gather together to commit ourselves to be a community of hope — a place where people can receive the eternal love of Jesus in His forgiveness, acceptance and support, and become transformed people through faith in Jesus, filled with hope. Whether we encounter a friend who is experiencing sickness or dealing with the death of a loved one, a family member who is making destructive choices, or someone who is simply feeling alone, each of us has the privilege to offer the powerful hope of Easter by loving them through the hope we have, in Jesus. Jesus said to His followers, “This is how the world will know you are my disciples, by the love you have for one another.” In the book of Acts, the world was watching and it saw the manifest love of Jesus and was drawn to it. The community experienced that love as those Christians moved out to share Christ’s love with others. We are all imperfect messengers, but for those who are hurting and hopeless that is better than no messengers at all! In this Easter Gospel, Jesus approaches you as He did Mary. Jesus is calling your name as He did in your Baptism. He is filling you with the powerful love of His presence that provides hope even in the worst of circumstances. Like Mary, Jesus is sending us out with a message, equipping us to be His ambassadors of hope in the world, in your home, where you work, among your friends and neighbors in this community. This is a message that must be shared, the primary mission of the Church, your commission and mine. As for my predicament, I honestly wondered if I was going to die. I wondered what it was like for my son and for my father. Death seems so overwhelming, often so much larger than life. Our greatest fear is that life is surrounded by death! Which is it? Is life being overwhelmed by death or death being overcome by life? Easter gives us a definitive word! One verse that came to mind in between the waves of pain was Revelation 1:18: “I am He who lives and was dead, and behold I am alive forevermore.” I pulled out my Bible and read those words again and again. As I stared at them it became clear that death was surrounded by life. Death was relegated to the past tense by two powerful truths: Jesus lived and is alive forever more. That was my sign that death was not to have the final word on that day or ever. So I resolved to stop trying to control my circumstance and let Kristi take me to the hospital ER where I could get the diagnosis and intervention I needed and that God intended. Kristi was shocked when I told her what I had resolved to do. She knew of my high pain tolerance and distaste for doctors or hospitals, and therefore concluded that I was desperate and in severe pain. A CT scan revealed a kidney stone; massive doses of pain medicine brought relief. After several days the stone was gone and so was any semblance of pain or discomfort. The day when everlasting life broke into earthly time began not with celebration but with tears. This is still the way Easter breaks into our lives — when we least expect it, when all seems lost. That’s when the stone rolls away, the angel speaks, Jesus is present and “death is swallowed up in victory.” Easter changes our perspective forever. This is the reason for the hope we have in us! Christ is Risen! He is Risen Indeed.